The drive from Las Vegas to Grand Canyon West is 2.5 hours using highway 93 & 95. 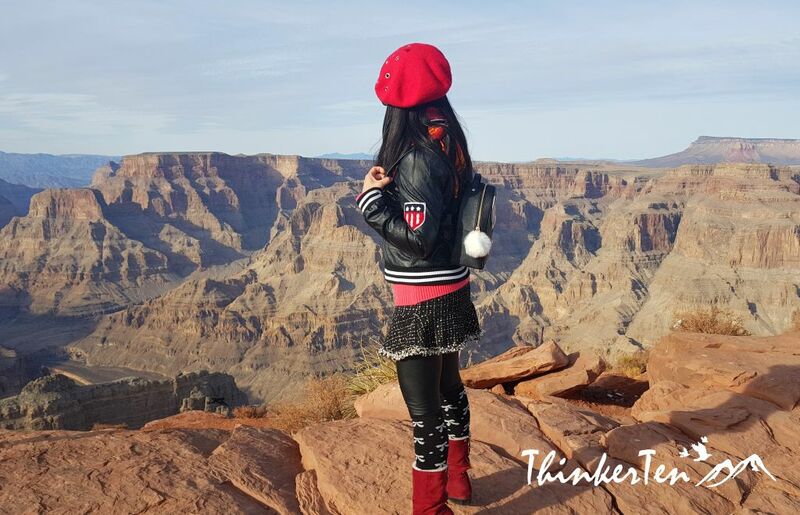 The Grand Canyon West is for tourists who visited Las Vegas as it is closer as compared to South Rim. Grand Canyon South Rim will need up to 5 hours if you were driving from Las Vegas. 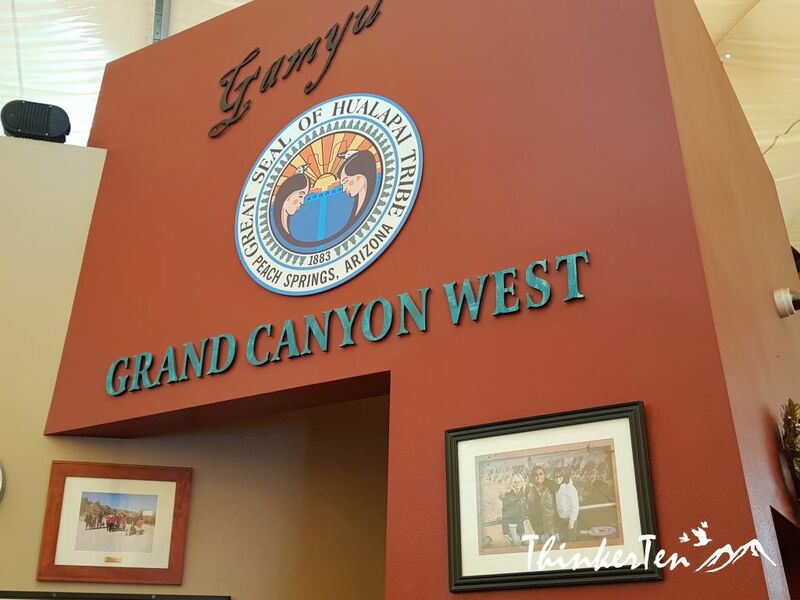 You can do day tour for Grand Canon West if you stay in Las Vegas – it is achievable. 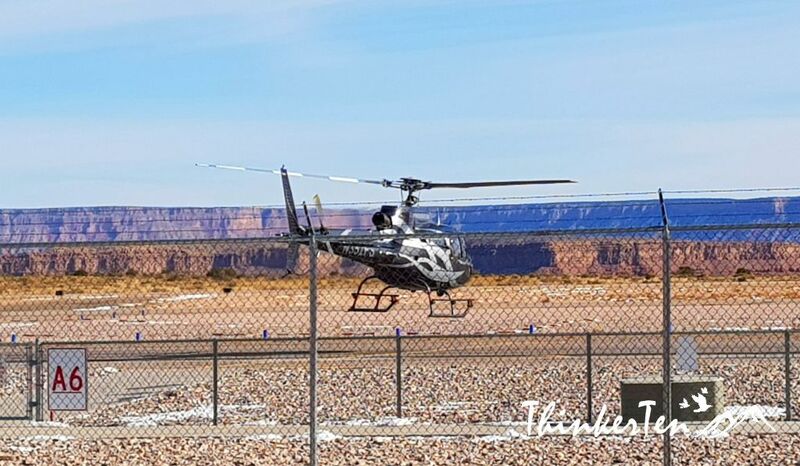 1.Helicopter is another way to see & access Grand Canyon! 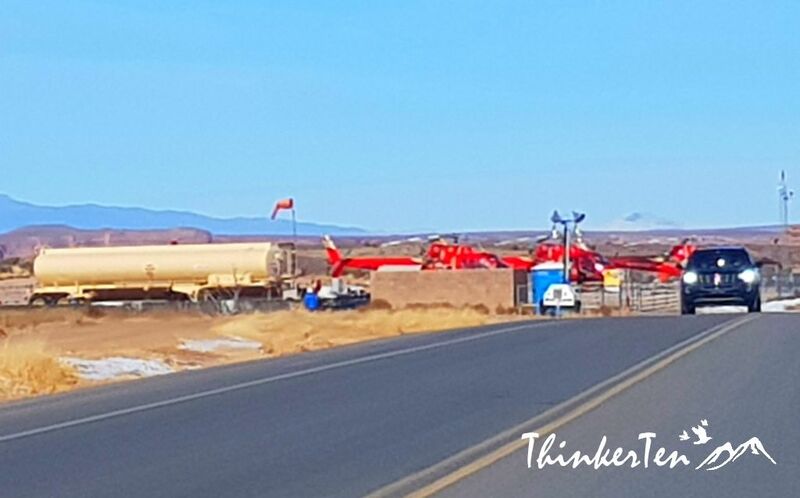 You know you are approaching Grand Canyon West Rim once you see all the helicopters and small planes line up beside the road. Tourists who prefer to have more challenging adventures, will use helicopter to help them reach the banks of Colorado River, where they can board a pontoon boat and enjoy a river ride between the rugged canyon walls. Call me country bumpkin, I never see so many helicopters in a row! Obviously helicopter business selling well here. Up to 20 helicopters park at the designated area waiting for the tourists to board. 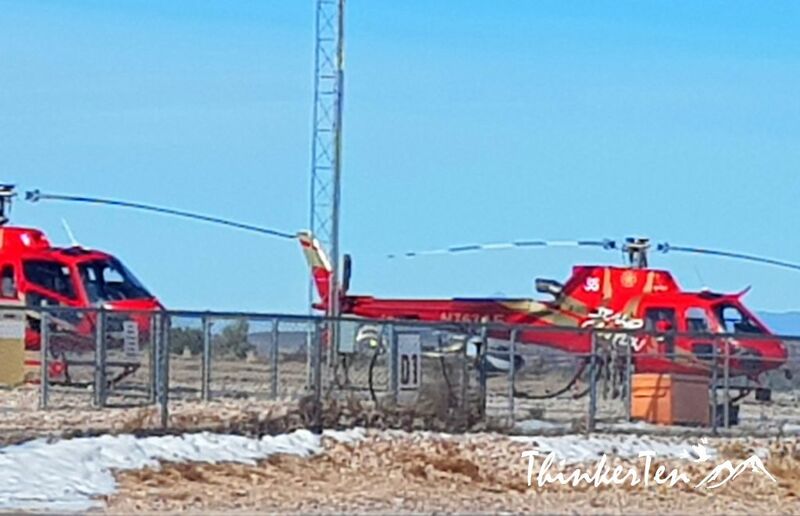 As you know there are many places in Grand Canyon where you can’t access without using helicopter if you need to see more of Grand Canyon. Some prefer to use the small plane to see Grand Canyon from above! 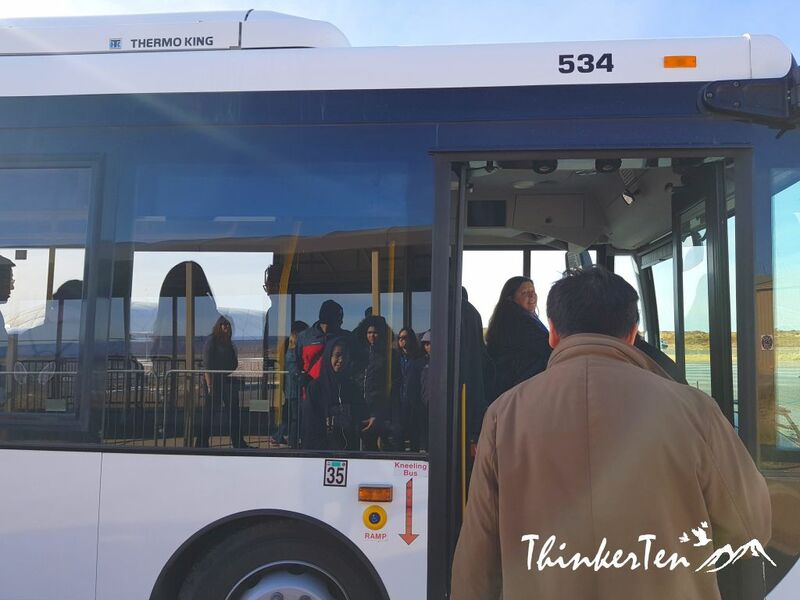 Grand Canyon Park is not accessible by private cars but there are shuttles bus which will bring you up. Go line up to purchase your tickets to enter the park! Or you can purchase online and print the voucher, that would save you plenty of time queuing. Trust me! 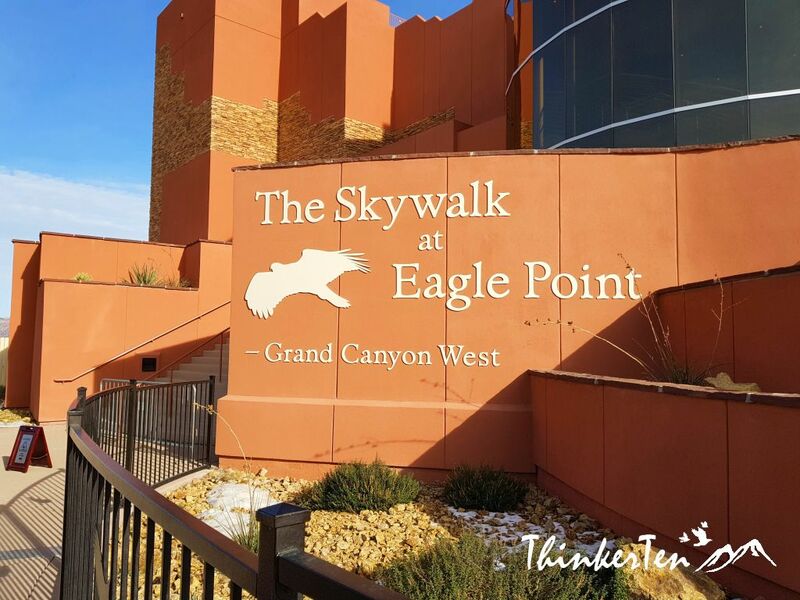 There are several package for you to choose from, we choose the Legacy Gold, $82.37 which include, Skywalk ticket to walk on the glass bridge, meal at viewpoint of choice & Hop-on hop-off shuttle to all viewpoints, including Hualapai Ranch, Eagle Point, and Guano Point. 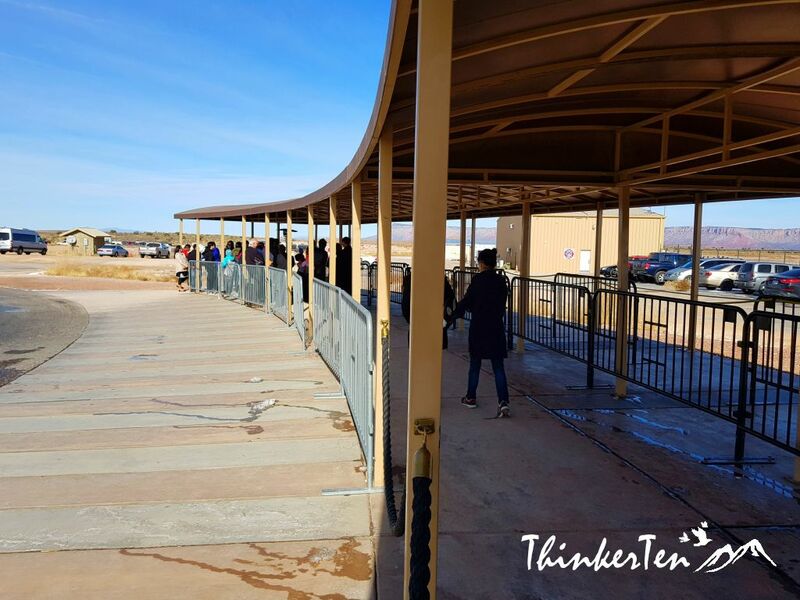 There is another cheaper ticket without skywalk & no meal which cost cheaper, $49.92 – only including Hop-on hop-off shuttle to all viewpoints, including Hualapai Ranch, Eagle Point, and Guano Point . 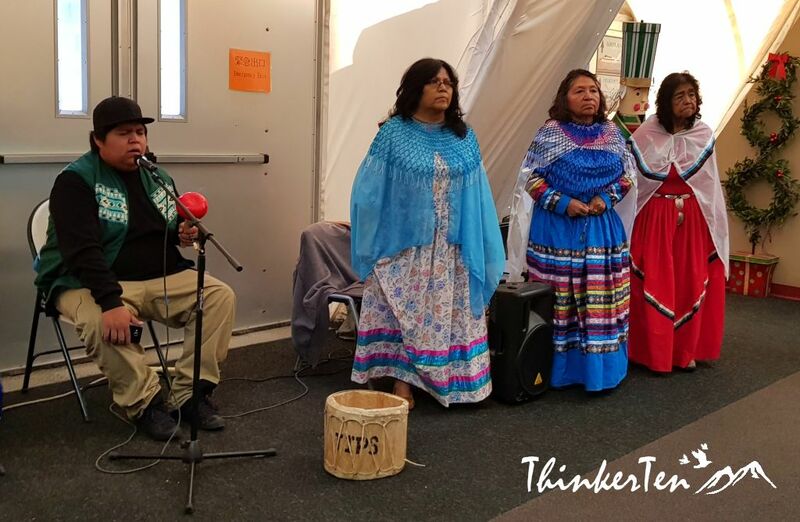 There are over 500 Indian tribes in America and I was happy to see real American native – Hualapai Indian Tribe here at Grand Canyon West. Hualapai mean “people of the tall trees”! 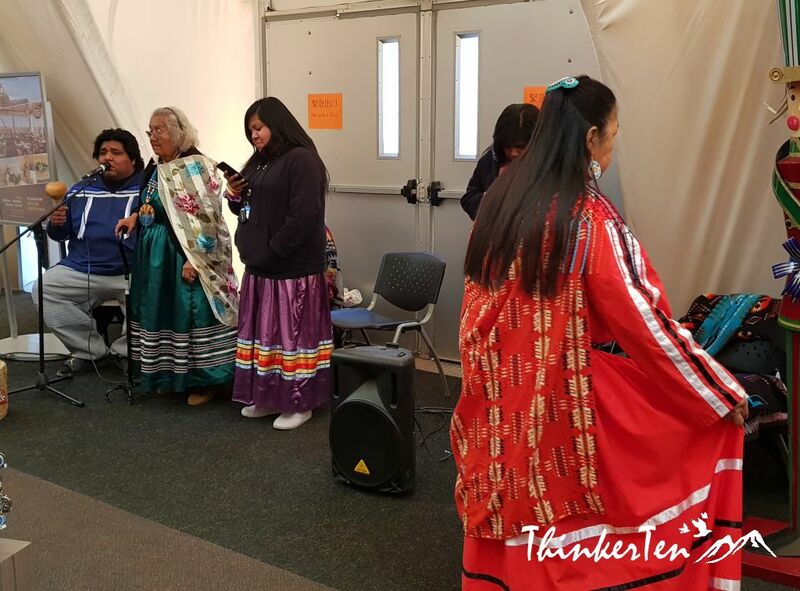 While queuing for our tickets, the Hualapai Indian welcome us with songs & music & dance. I love their cape. The Hualapai are natives of northwestern Arizona, near the Grand Canyon. They have their own native language called Havasupai–Walapai. They sing in their native language! 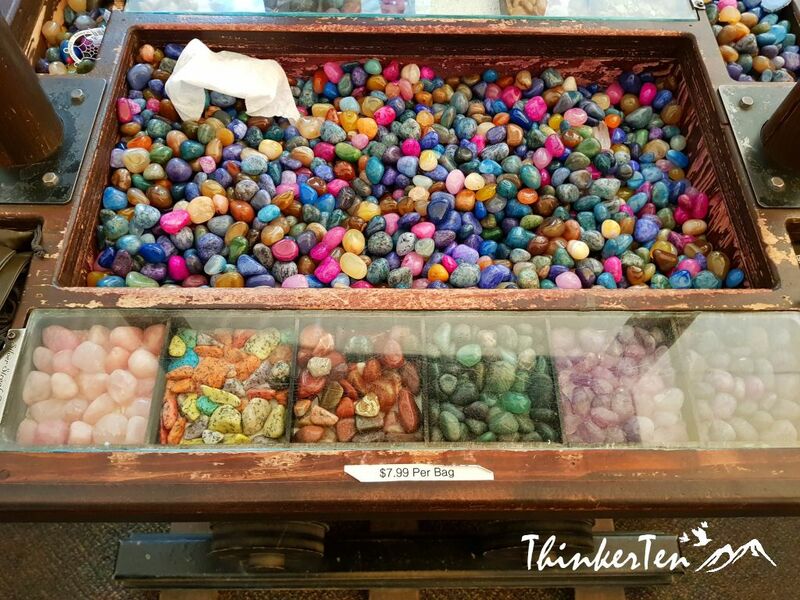 Colorful stones sold at the ticketing area. A small bag cost $7.99 for you to fill in whatever color of stones you like. It was still early, about 11 am when we started to explore the park so the queue for the shuttle bus was not too long. You should see after 3 pm, the queue was insane. Shuttle Bus to bring you up! Friendly female driver! 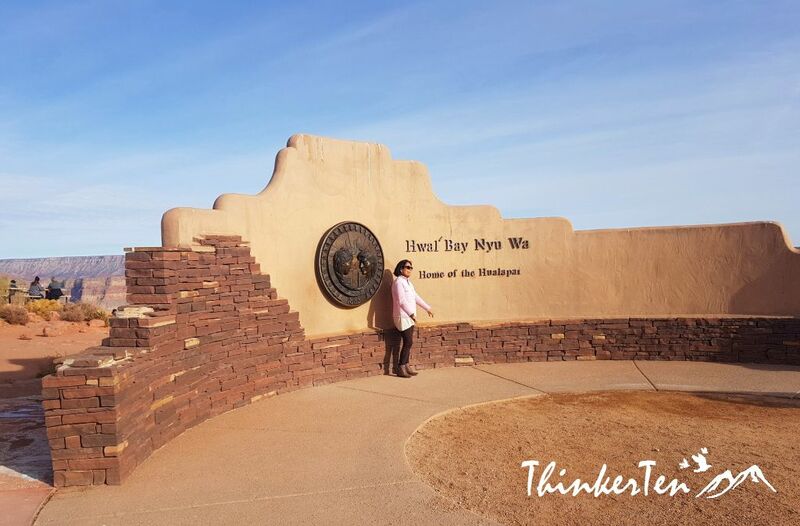 -Hualapai Ranch & Eagle Point & and Guano Point . 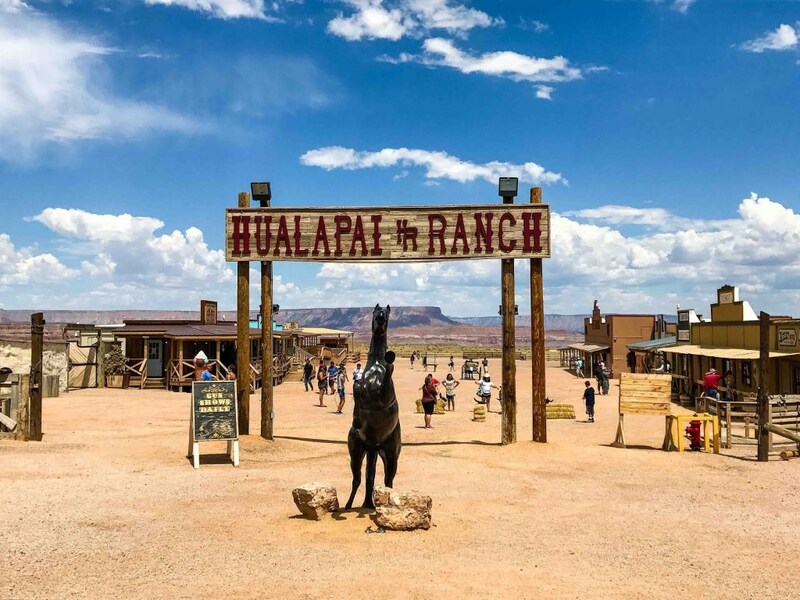 Tourists who like to see more of Grand Canyon can stay overnight at the Hualapai Ranch. You can watch the early sunrise from the porch of your cabin. The ranch was build like an old western town, not sure why they called it Hualapai Ranch, more like an old western town? A lot of walking but mostly man-made. 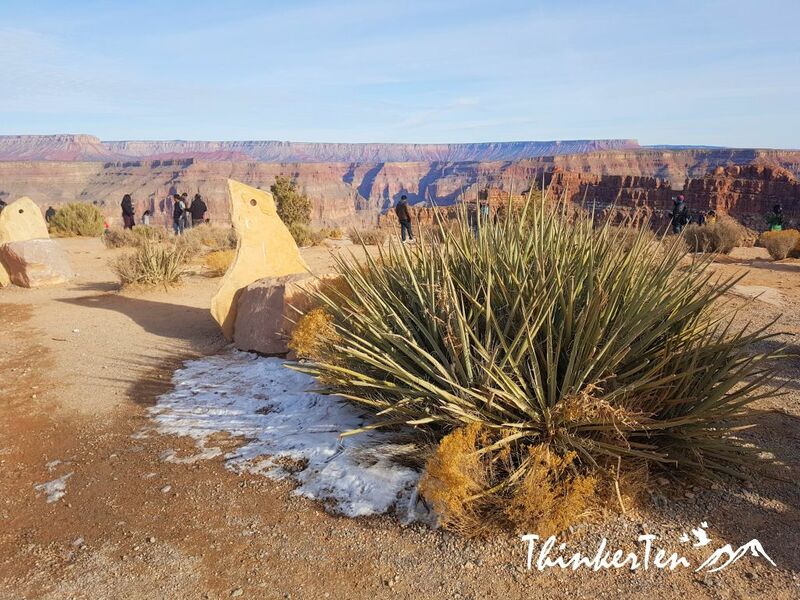 If you are here for nature wonder – Grand Canyon, you may want to skip the first stop – Hualapai Ranch. 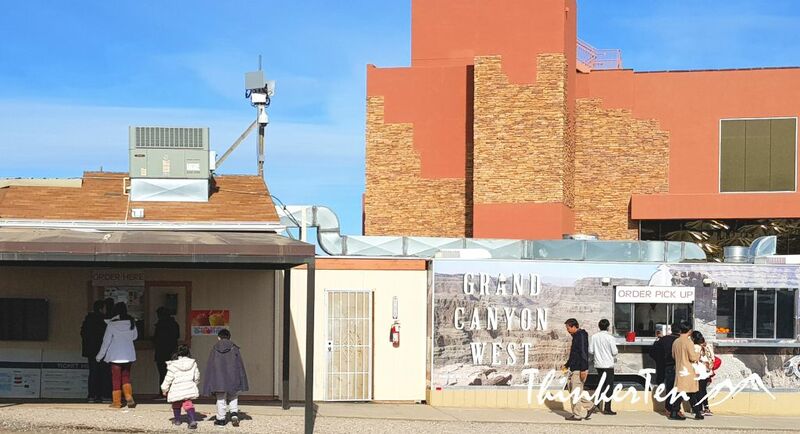 Get your camera ready throughout the 10-15 minutes during the Grand Canyon shuttle bus ride. Breathtaking view and I happened to see a coyote walking at the roadside. Eagle Point and Skywalk is at the second stop. This is a must see attraction, you paid so much for this magnificent sight. Don’t go too close to the edge as the ground may look stable, underneath it can be undercut. Many have accidentally fallen off the edge while taking risky pictures. When I was there, there is a ranger who walks up and down to ask excited tourists to stay away from the edge. 12. 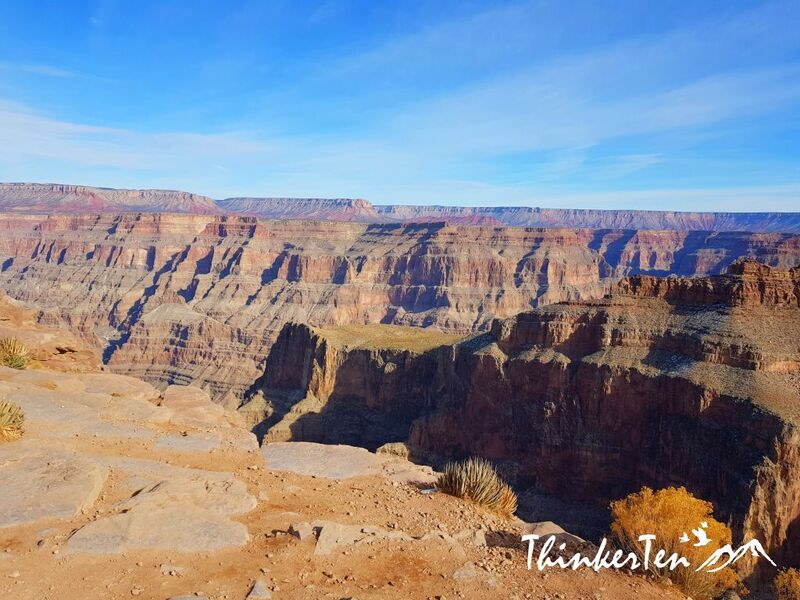 Have you wonder why the Grand Canyon is so flat at the top? 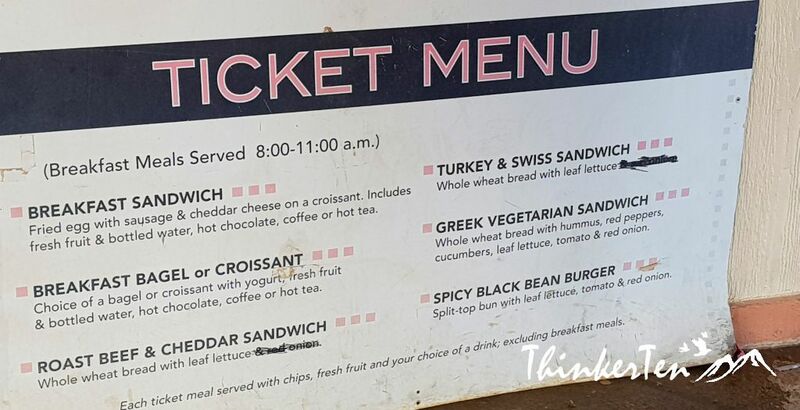 If you hold the Gold Legacy Package ticket, a meal is included in your package. Go and select the choice you like to have. One window serve rice, I think for Asian and the other window serve sandwiches. 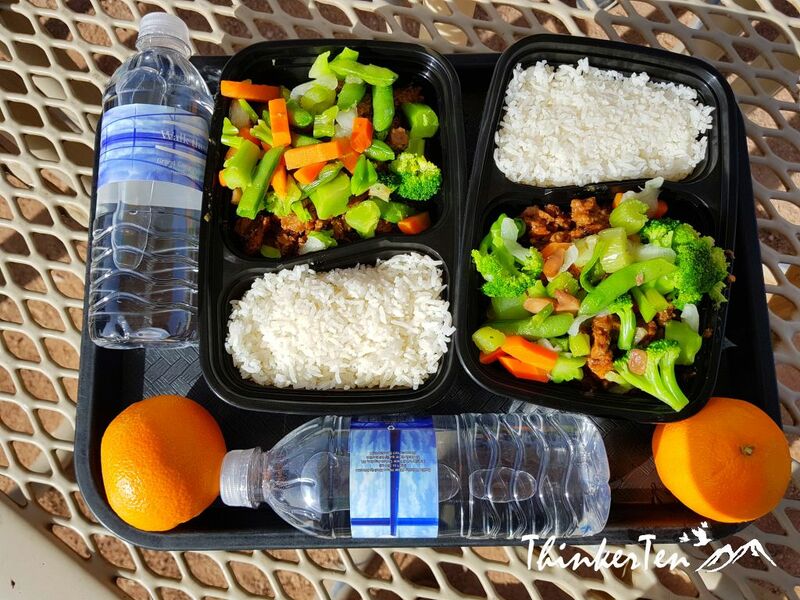 For Rice, there were two choices, chicken and beef. We choose beef and turn out to be right choice as it was so yummy! The meat and vegetable were serve generously. A bottle of water and an orange were included. There are plenty of table & chairs alfresco style for you to have your meals or picnic. I saw few cleaners were working hard to make sure the picnic areas is clean and comfortable for the tourists. Hey, remember we paid a high fees to get in this park! This is the highlight, if you purchase the Gold Legacy, you are entitle to do the Skywalk. There is a security check and all bags have to put in the locker including camera & mobile phones. No photo taking with your own phones however photographers are there to help you shoot pictures. 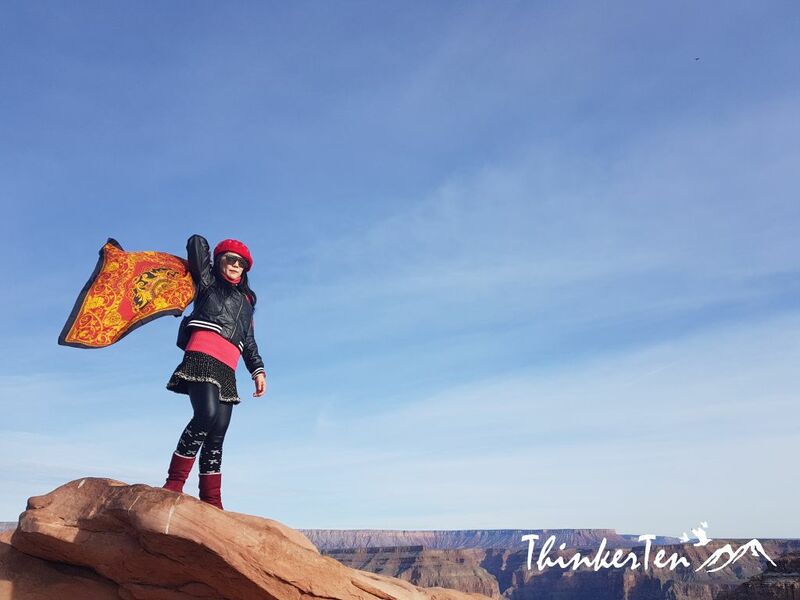 How was the feeling walking on the glass platform above 4,000 feet above the Grand Canyon? It was simply nerve-racking but fun & thrill. This 10-foot-wide, horseshoe-shaped glass bridge extends 70 feet out over the rim of the Canyon. If you know the fact that Skywalk is strong enough to bear the weight of seventy 747 passenger jets, you won’t bear that much of fear when you do the Skywalk. If you look down, you will see Colorado River and you will notice the width of the river is very narrow as compared to other rivers that you have seen. Weird, why so narrow?? 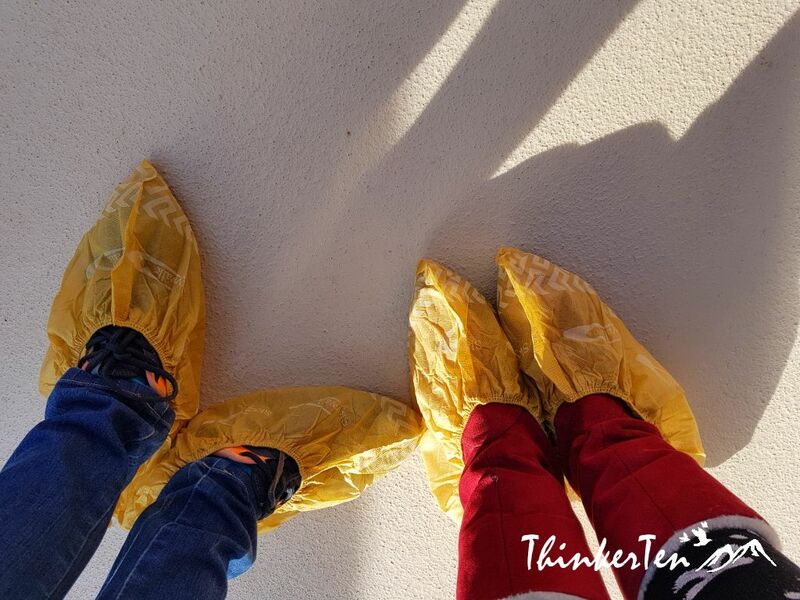 Since you are walking on the glass, you are also given disposal paper socks to wear, to protect the glass in the Skywalk. 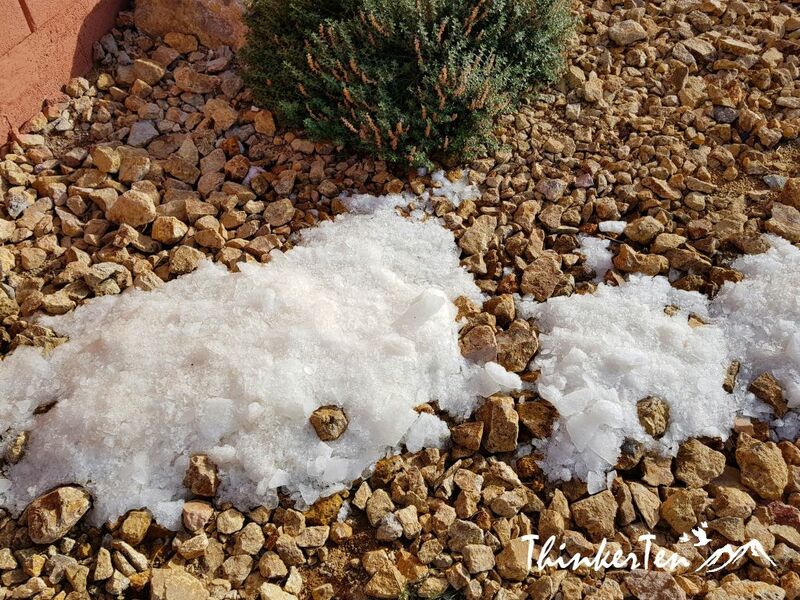 Some ice can be seen, weather in the afternoon was not that cold to be frank. The ice were from last night I guess. 15. 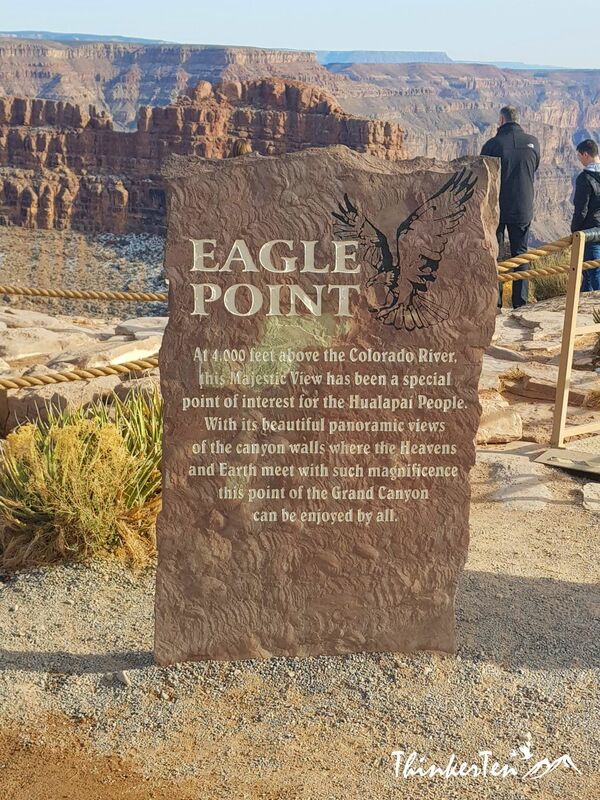 Eagle Point – go spot the Eagle! 16. How Did Eagle Point Get Its Name? 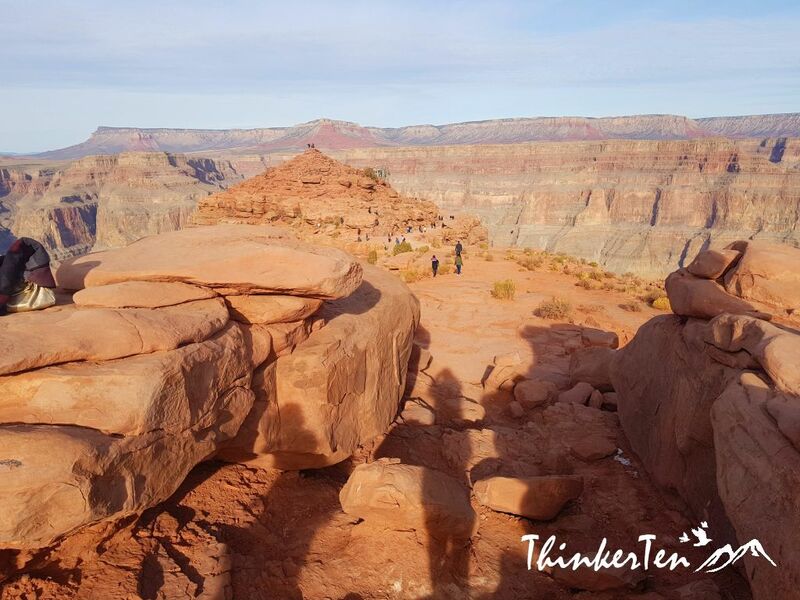 Eagle point is an important and scared site for the Hualapai people. The site earned its name from the rock formation that you can see across the canyon : the formation looks like a bald eagle with its wings outstretched. Very obvious. 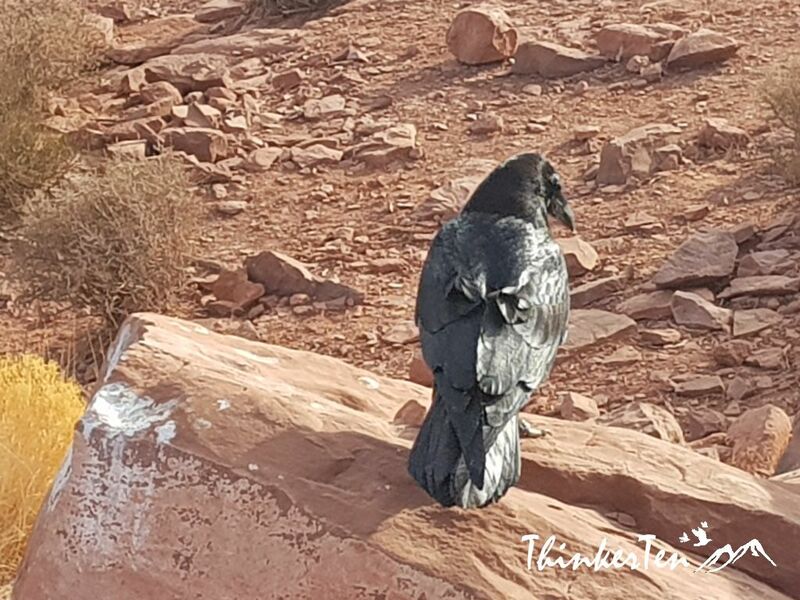 Natural rock formation that looks like an eagle! 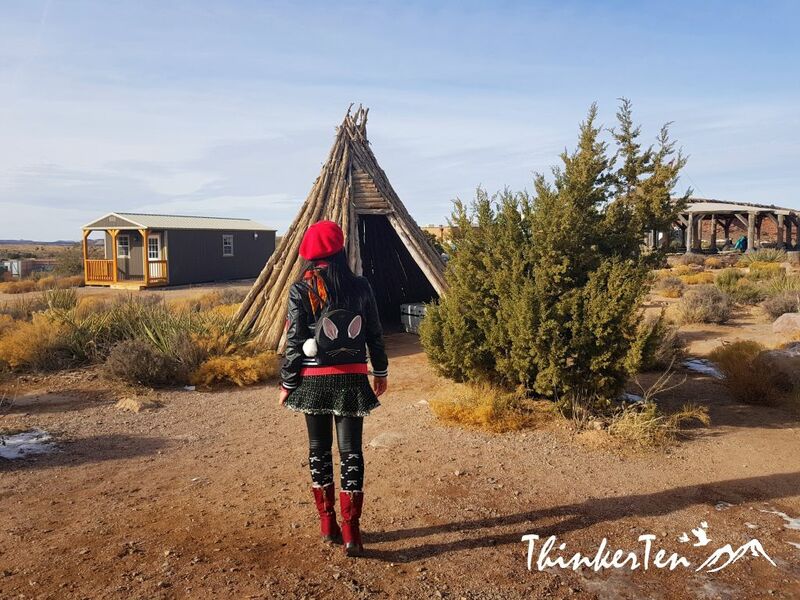 Go in and check out the unique architecture of this little Indian hut! 19. 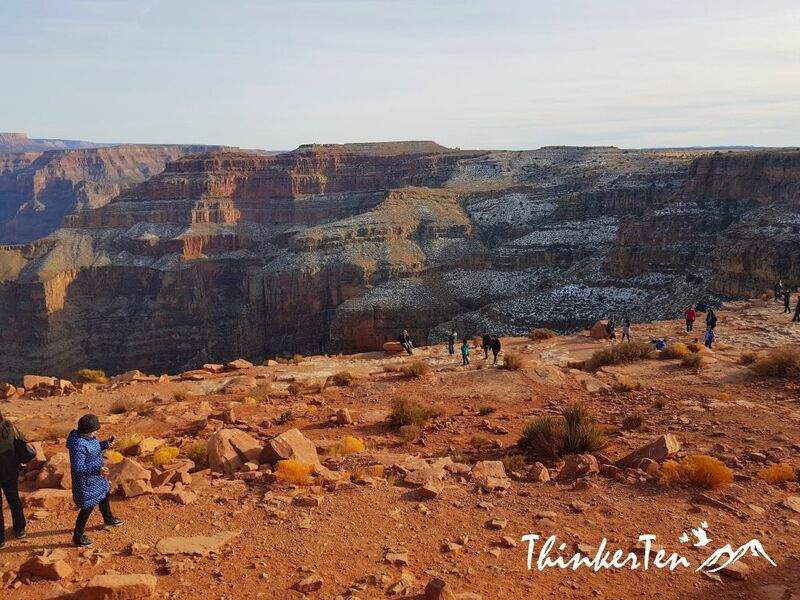 Grand Canyon is colorful – Go observe! 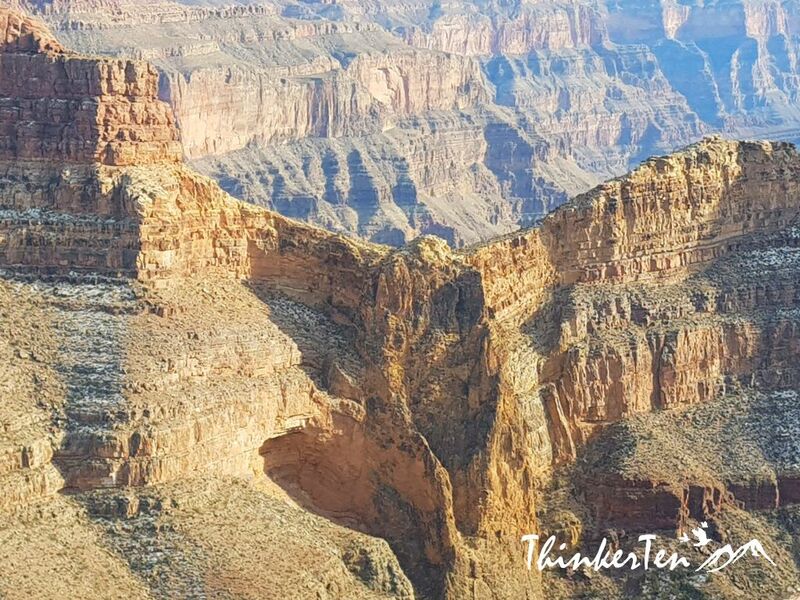 If you observe closely, you will notice different colors in the Grand Canyon. Quite colorful – some purple, blue, orange, yellow and there may be slight differences in everyone’s vision. There are actually more death due heat or dehydration than falling. Report show about 12 death in a year, including falling, suicide, heat & drowning. 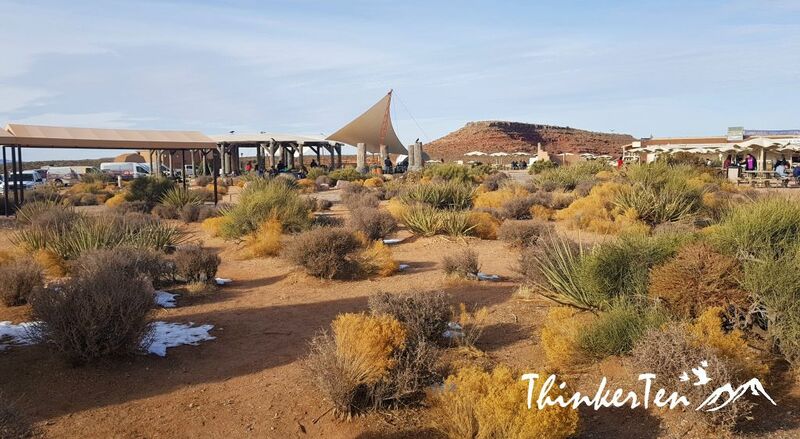 Watch Native American dances in the amphitheater each day at 1 p.m. and 5 p.m.
You need to ride on shuttle bus for another 10 minutes to reach Guano Point. This is the last site in Grand Canyon West Park. I find that viewpoint at Guano Point is even more spectacular than Eagle Point. It is even higher than Eagle Point (second stop). There are plenty of rocks for you to climb up and down. In Guano Point, most of the things are still untouched. I would say Guano Point have the best view in Grand Canyon West. Weather changes dramatically day and night so be prepared to have enough clothing. Come early to avoid crowd, when we were leaving at 3 plus, saw the queue for the tickets were super long! The queue was so long that it went few meters outside the kiosk. Pity to see tourists standing under the hot sun and queue for hours. No wonder the shuttles bus driver asked us to get up the bus even the bus was so full. She wanted to help us get out the park before more tourist flushing in. Purchase ticket online and skip the queue, you can straight away queue for shuttles bus. Save you plenty of time for sure! Plenty of water to keep yourself hydrated, many dies of heat. Stay away from the edge, many fell and die. Oh I would love to explore the Grand Canyon in a helicopter or a small plane. That must be absolutely amazing. Dipping in between all those ridges – yes please. 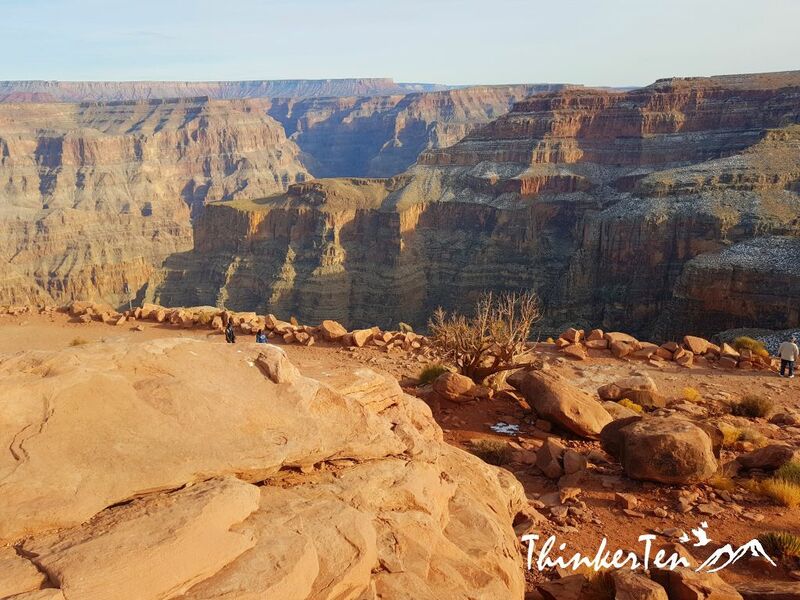 Exploring Grand Canyon with the helicopter is one of the best way to see the colorful canyon and the helicopter also brings you to reach many places that is not easily access by road. With all the many great things I hear about the Grand Canyon, I know for sure that I have got to travel to this destination some day. Hopefully soon! Grand Canyon is so big and there are many access from different direction. Be it South Rim or West Rim, it is beautiful with it own way. Hope you visit soon and enjoy just like I do. Wow! What an experience! I have never been to the Grand Canyon but it is definitely a place I want my son to experience. What a great lists here. I’m going to print this out to add to our travel documents. Thank you! I am sure your son would love Grand Canyon! 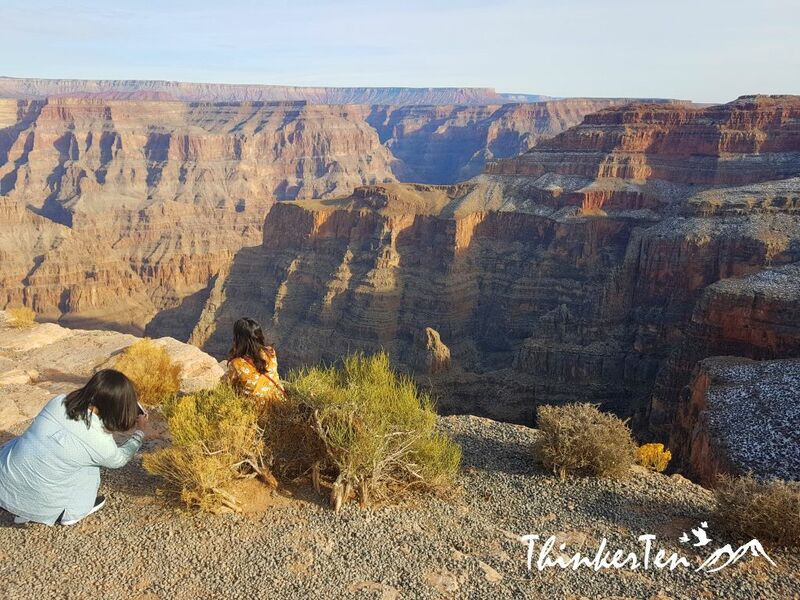 Always be extra careful when you are bring kids to Grand Canyon and don’t go too near to the edge 🙂 Kids get too excited some time. Wow, I would LOVE to fly over and see the Grand Canyon via helicopter. how amazing would that be! Thanks for the tip to buy tickets online! Online do save you a lot of waiting time I can guarantee you that! The queue is insane especially during holiday! This looks amazing. I love your photos. The views from the air must be absolutely stunning, it must really give you a sense of quite how grand it is. 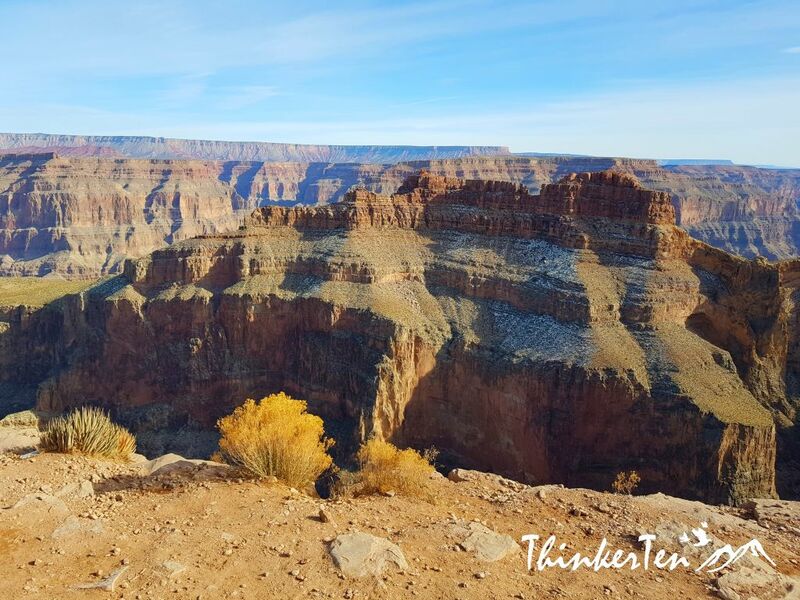 You are so right, I can feel how huge the Grand Canyon is while I was there, simply stunning and one has to see it with his/hers own eyes! Now thats an experience. I have never been to Gran Canyon before but i sure would like to experience it one day. I love that you made a list. I will make sure to bookmark this post. What an awesome experience, I’d love to see the Grand Canyon one day. 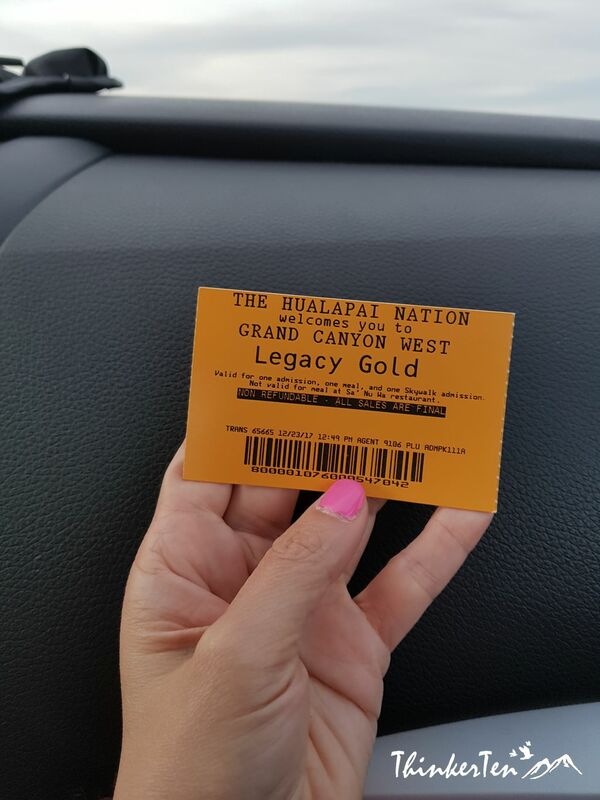 I love that the Hualapai made you feel welcome and you got to experience some of their culture too, that is amazing. 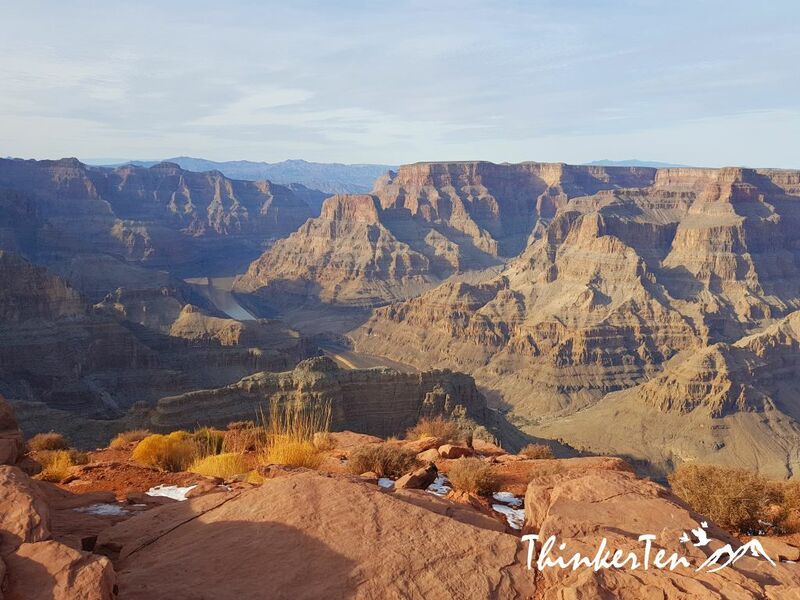 The grand canyon looks absolutely breathtaking, you are so lucky to see it! It looks like you had a fantastic time. Amazing trip! I would love to see the Gran Canyon once, and go there with my family. I find it quite a bummer though that you can’t take pictures in the skywalk. You say there are photographers that “help you take your pictures” but I bet their pictures aren’t for free, am I right? The photographers do charge for the picture taking! About 5 of them stay at the skywalk helping visitors shooting pictures from all angles. It is a pity that visitors has to lock their phones/camera in the locker before entering the skywalk. However, the feeling was thrill if you look down as the bottom is made of glass. You also get to see how narrow river Colorado is from the bottom, between the canyons. What an interesting post! I used to live in Arizona as a baby and my parents took me when I was very small, but I would love to visit again!! The skywalk sounds fascinating…I was looking forward to seeing photos so I’m sad they didn’t let you take any pictures! What an awesome trip! It must be nice to stay and grew up in Arizona. It is such a beautiful place. 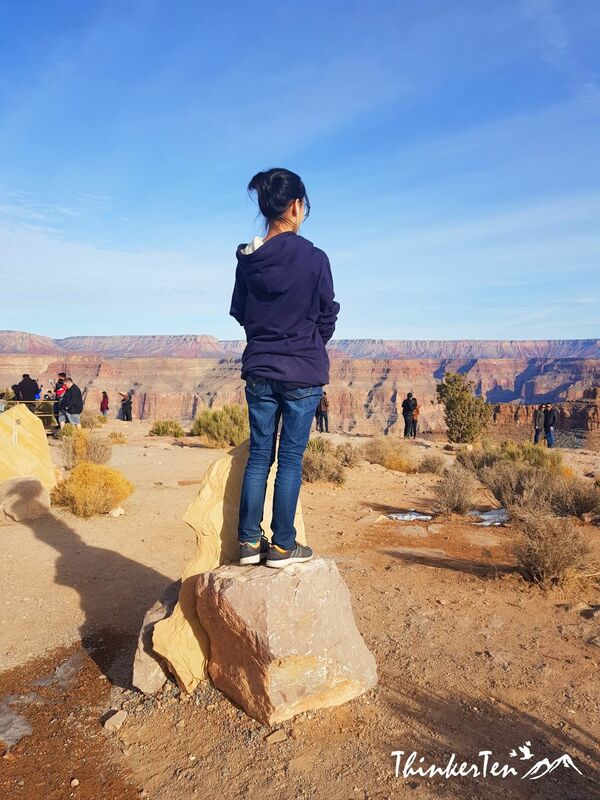 I have been flying for more than 17 hours by plane and many hours by road to see the magnificent Grand Canyon! Grand Canyon is quite breathtaking. And that’s quite a list. I am saving it for future reference. Thanks for sharing. The Grand Canyon is definitely on my bucket list. You provided some valuable tips that anyone can use when visiting. I will keep this info in mind. Wow! This sounds like a great trip with wonderful sites. The ticket you bought definitely seems worth the price. I would love to see the views from the Skywalk. The views from a helicopter or small plane must be spectacular! I visited Grand Canyon 20 years ago. I learnt to appreciate it more now. I guess nothing much has changed compared to 20 years ago, except the newly build skywalk.